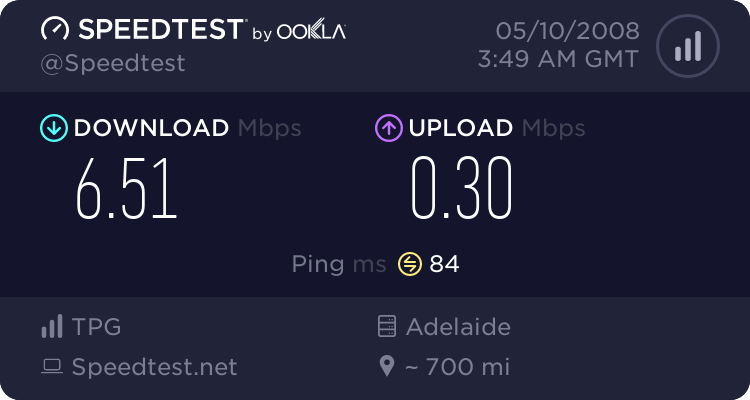 From time to time I like to do a speed test on my internet connection, I’m proud to say mine is pretty nice right now. This entry was posted in Internet / Online and tagged ADSL2+, Internet, Internode, Speedtest on October 7, 2010 by JAB_au. I got board so I did a speed test. So how fast is your net access compared. Oh yes and remember, don’t have other programs using your net connection or the results will be fudged. This entry was posted in Internet / Online and tagged Internet, Internode, Speedtest on June 24, 2007 by JAB_au.